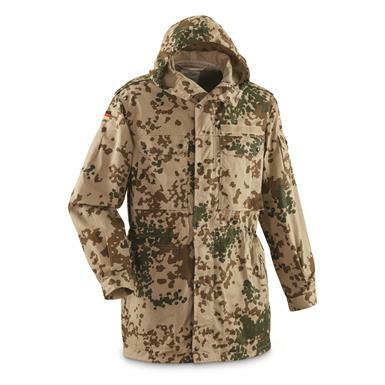 Get into the German army spirit while wearing this Tropical Flecktarn Parka. Well-structured design and military issue dependability will keep up with your active lifestyle. Wear it in the field for outline breakup while hunting, or added to your paintball wardrobe lineup to adorn it with extra-colorful paint splatters. Center back length: Approx. 34"
German Military Surplus Tropical Flecktarn Camo Parka, Like New is rated 3.3 out of 5 by 3. Rated 4 out of 5 by mike golf 99 from awesome camo jacket Goes with my tropical Flecktarn shirt 2 pack from SG ! Love this coat. Bought the darker green one too. Quality workmanship. Like new condition, but I have an ink pen stain in one pocket. I got the large because I have lost weight recently, but not enough weight - LOL - my own fault. Little snug, but I just cant layer - that is okay. I am 6' even and weigh about 205, and I got the L. An XL may have been too big. This is quality one-of-a-kind stuff. Get one just to have it in your collection - wears well, and is a great conversation starter. Rated 2 out of 5 by Surplus junkie from Look like new It is in very good shape, but it’s too LONG in length, I mean really. Really long.You have to be 9 feet tall to have this parka fit you.I bought size large, it fits well, correct to my body, but again the length of the parka is too much. Rated 4 out of 5 by Bjorn from Awesome parka, same sizing issues with SG I've really wanted to find a good copy of this tropentarn parka and Sportman's Guide seemed to be one of the only places left with any that are almost unissued condition. Knowing what I know about their issues with sizing I ordered two and sure enough I'm glad I did because the designations here don't line up to Nato sizes. Even with that problem, I'd actually recommend them since both of the ones I received looked almost new and had no wear marks anywhere.